The stairwell from the main floor to the basement has six steps down to a landing a 180 turn and 7 more steps to the basement floor. To make this happen a bog hole needs to be cut in the main floor. This hole is not a rectangle as might be expected but takes a bit of a jag over the downward half the of the stairwell. Taking that much of supporting joists out of the floor means more bracing has to go in around the stair well opening in the floor AND and additional beam is used to support the section at the entrance to the stair well. 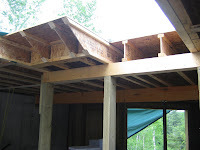 The beam is supported by three columns in the basement as shown in the next two pictures. The engineered joints are still exposed so you can see that that there is plenty of support from the center beam through to the extra beam for both the floor section ending at the beam and that section of the floor that is cantilevered over the new beam. 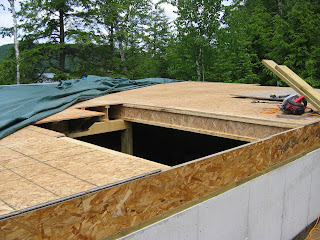 You will also notice that the cantilevered section of floor is also cut at an angle leading down to the basement. The purpose of this angle is to provide the building code clearance for your head as you step down the stairs. Finally there is a set of blocking with short pieces of the engineered joists to provide further support at the end of the cantilevered section of floor. 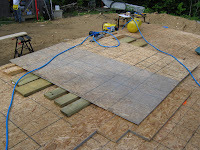 There will eventually be a rim board which will cover the ends of both sections to further strengthen the end portions of the floor. 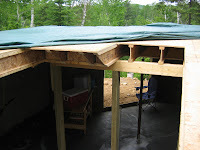 For safety and to support the tarp which we not dutifully place on the floor every night and at the end of our weekend of work, we place lots of lumber and two hunks of 4' x 8' over the hole. Human nor water can now enter the basement through the stairwell opening, at least not until the stairs are built!